I spent the May Long weekend with nearly 30,000 museum goers – how about you? 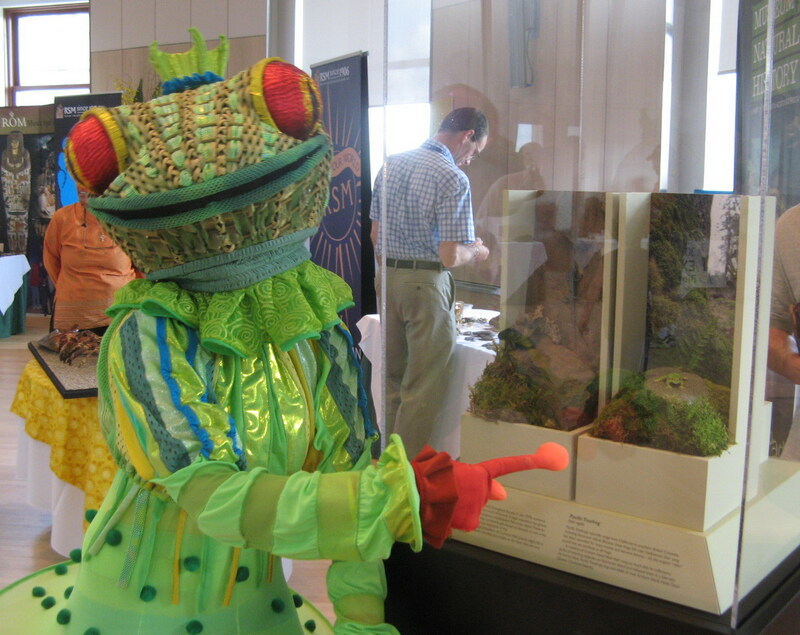 The Canadian Museum of Nature (CMN) in Ottawa successfully delivered on their motto of “More Nature Plus” during their Grand Reopening events from May 22 - 24. I was in attendance along with Gavin Hanke, one of the Royal BC Museum’s Natural History curators, and 12 member organizations of the Alliance of Natural History Museums of Canada to provide family friendly activities for “Nature Fest” – one of the many activities taking place at the CMN over the weekend. Nature Fest was a super opportunity for visitors to learn about museums acro ss Canada and for the museums to share our collections and messages with them. The Royal BC Museum took a display case (pictured to the right) from our upcoming “Aliens Among Us”, part of the Behind the Scenes exhibition and a puzzle to help visitors learn about alien species. It was fun to talk to kids about “aliens” and to watch them light up when they completed the puzzle. In addition to the thousands of visitors who came through, I was delighted to meet colleagues from the Alliance. Their enthusiasm for nature and education was contagious and I look forward to connecting in the future to share resources and ideas. In addition to Nature Fest, visitors were treated to a parade, live presentations, magical Rainforest Creatures, (pictured left admiring our display case), live music, films, 3D demos and Ghost Tours. The real attraction was the building itself and the new galleries. All of the galleries have now been renovated including the RBC Blue Water Gallery and the Vale Earth Gallery. Of the Blue Water Gallery’s 200 specimens, 90 per cent are on display for the first time. The gallery includes an impressive juvenile blue whale skeleton flanked by two touch-screen terminals brimming with information. You can watch a time lapsed video of the assembly of the skeleton here. The Blue Water Gallery also features the coolest playroom ever – a scaled down research vessel for children. As a programmer and museum fan, I was impressed and inspired by the number of hands-on activities available in all of the galleries. The Vale Earth Gallery was also unveiled over the weekend. During my sneak peek tour on Friday, the gallery was humming with installation (pictured on the right). By the time the doors opened at noon on Saturday, the amazing exhibits were ready, complete with an impressive two meter HD globe that visitors can manipulate to learn about the formation of the planet. I would like to send my thanks and congratulations to all involved in the renovations of the Canadian Museum of Nature and those who organized such a fantastic Grand Reopening. If you would like to see more pictures of the event, visit my own personal Flickr page here and select the Canadian Museum of Nature album. Have you been to the Canadian Museum of Nature – what do you think about the changes? What should museums planning renovations keep the same and what should they change? Great to see the kind of thing that museums across the country are doing! I'm proud that the RBCM was so involved.